My daughter lives this for her room. The Celeste Collection provides a boho look to your space. This unique collection features a mixture of medallions and tribal geometrics in stripes of yellow and green with pops of navy. Two decorative pillows use coordinating motifs to create decorative pillows that pull this look together. The set was purchased for a guest room . The colors are white , a turquoise that is more green than blue , and navy blue . It is decent quality for the price . The set includes two unlined shams . Very pretty. Extra pillows are nice. The comforter is holding up well and the colors are very vibrant. The queen is nice and big - works well on a platform bed. The throw pillows are high quality. 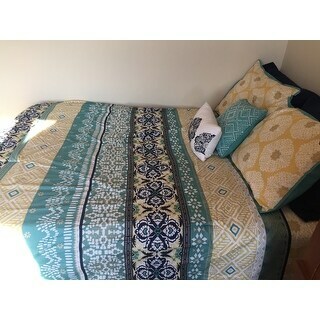 The pattern on the comforter is beautiful and the fabric is silky soft. It is not a very "puffy" comforter, but I always layer up for Vermont winters anyway and I know I'll be able to use it in the summer. Nice quality, good colors - true to the picture. Throw pillows are embroidered, not printed - nice touch! Wish there were more stitching holding the comforter together. The fabric is light-weight, so the set will not maintain its look on the bed if you have pets or if you tend to throw things on the bed when getting dressed. Overall, I am pleased with the purchase. Looks just like the photo (my camera/lighting quality isn't the greatest) but I love this bed set! Found baby sheets that match perfectly. We bought this for our daughter to take to college with her. It is a very nice comforter. The yellow and teal colors were very pretty. The overall comforter set was a good quality. Happy with my purchase. I love the colors! & it is so comfortable! The comforter arrived in good shape. It looked and fits as I expected for a normal queen size bed. Love the comforter. Great for the price. Color is vivid and material is soft and cozy! Extra throw pillows are a nice complement to the set. Very nice comforter set. Colors are accurately represented and quality is good. this comforter set is a great value! It's nice, but the fabric is a bit cheap. Looks great in my guest room! My daughter loves her comforter. It is not too heavy. Low quality comforter. All the insulation settled super quick. Would not buy again. Nice color just as described. It was a Christmas present to my mother and she's thrilled. We are putting on bed after washing this evening! Would buy again! Great price and look just like shown in the picture. Light weight and stylish we loved it until after washing. Stuffing clumped and it was never the same. "Is this set available in king size"
"What size is this because I am not sure when adding it to my cart?" The only one available is "full,queen". "What do I need to purchase to fit twin XL in length? It appears most twin bedding does not have the length." "Where can I find the canvas/wall art that is in the photo?" Unfortunately we don't have any info regarding the canvas. "What color sheets will go with it"
"Is the green color teal?" Yes, it is more of a teal color. "What is the thread count for the comforter?" This is not cotton-based fabrication, it is polyester microfiber. There are high thread count you see in the market place for microfiber. This is trying to confuse the consumer using cotton-based thread count concept on the microfiber fabric. Microfiber has fine yarn which has higher thread count and cheaper.